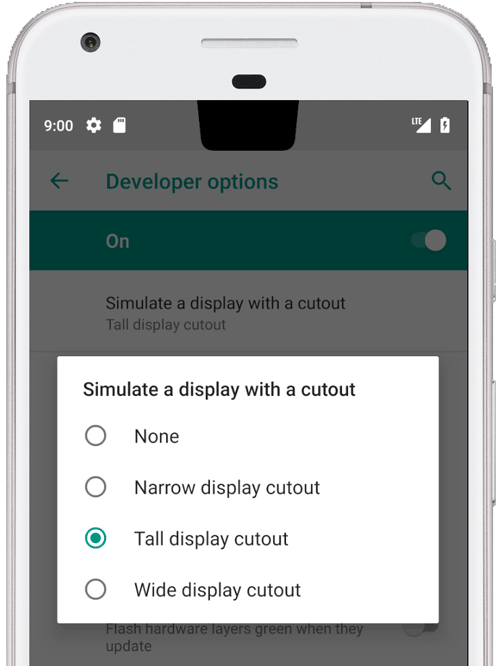 Android 9 adds support for implementing different types of display cutouts on devices. Display cutouts allow you to create immersive, edge-to-edge experiences while still allowing space for important sensors on the front of devices. The following window manager code at PhoneWindowManager.java shows how display frames are inset to the safe area when LAYOUT_IN_DISPLAY_CUTOUT_MODE_ALWAYS is not set. // the cutout safe zone. // the window from that area. // Same for the navigation bar. // The IME can always extend under the bottom cutout if the navbar is there. // the cutout according to that parent and don't need to be further constrained. // Floating IN_SCREEN windows get what they ask for and lay out in the full screen. // which prevents overlap with the DisplayCutout. SystemUI renders in the cutout area, and needs to determine where it can draw. PhoneStatusBarView.java provides an example of a view that determines where the display cutout is, how big it is, and whether or not the inset from the nav bar avoids the cutout area. By overriding onApplyWindowInsets(), a view can determine where the cutout is and update its layout accordingly. These methods outline how cutouts are handled in the status bar in all cases (i.e. top center, top uncentered, bottom, and dual-cutouts in all rotations). Your device can have up to one cutout on each short edge (top and bottom). For more information, see the CDD. Note: For apps targeting Android 8.0 or lower, you can provide users with an option to extend a fullscreen or landscape app into the cutout area (e.g. toggle in the navigation bar). As this may lead to content getting cut off, the layoutInDisplayCutoutMode activity theme attribute has been backported to Android 8.1 to allow apps to opt out. If the attribute is set, you may not show a special mode toggle. To implement display cutouts on your device, you must configure the following values for System UI. Defines the top margin for the quick settings panel. The clock and battery are displayed in the space above the panel. In values-land, set to status_bar_height_landscape, and in portrait set to either the default of 48dp, or the height of the cutout, whichever is larger. Can optionally be taller than the cutout if desired. Total height of the quick-quick settings panel (collapsed quick settings panel) when the notification shade is expanded, including the space above the panel containing the clock. Because of the way quick settings is laid out, the total height of the quick-quick settings panel (including the offset) must be known statically, so this value must be adjusted by the same delta quick_qs_offset_height. Values-land defaults this to 152dp, while the portrait default is 176dp. The default height of the status bar from the framework's perspective. In most devices, this defaults to 24dp. When there is a cutout, set this value to the height of the cutout. Can optionally be taller than the cutout if desired. The height of the status bar in landscape. Cutouts are only supported on the short edges of the device, so this will always be an unaltered status bar height. In a device with no cutout, this is equivalent to status_bar_height_portrait. When a cutout is present, keep this value at the default status bar height. The path defining the shape of the cutout. This is a string parsable by android.util.PathParser, and is how the size and shape of the cutout is defined to the system. @dp can be specified on the path to emulate a shape targeting different devices. Because physical cutouts have an exact pixel size, do not use the @dp specifier when defining the path for a hardware notch. A boolean value that determines whether to draw the cutout path (defined above) in software. Can be used to emulate a cutout, or to fill in a physical cutout to achieve anti-aliasing. If true, config_mainBuiltInDisplayCutout is filled in black. <!-- The bounding path of the cutout region of the main built-in display. center top of the display. appended after the path string to interpret coordinates in dp instead of px units. Note that a physical cutout should be configured in pixels for the best results. black in software (to avoid aliasing or emulate a cutout that is not physically existent). To validate your implementation of display cutouts, run the CTS tests at tests/framework/base/windowmanager/src/android/server/wm.